Of the many images I’ve seen from Australia’s current tour of Sri Lanka this is my favourite. It gives me hope that Australian cricket hasn’t completely lost the plot. 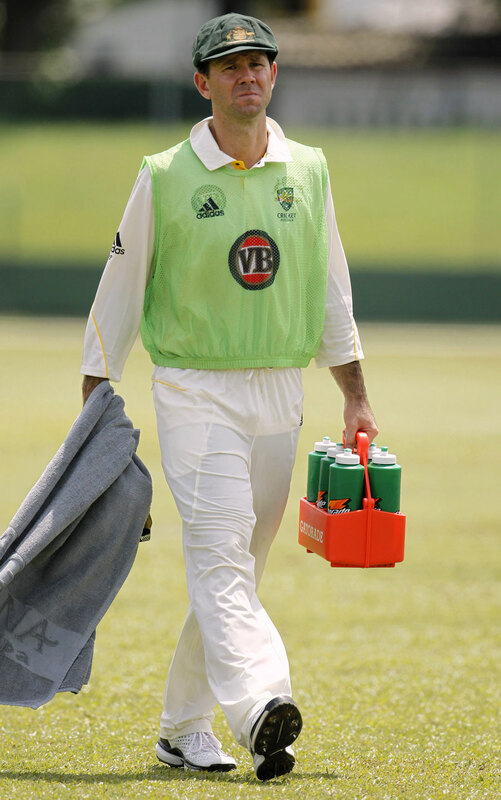 The former captain carrying the drinks is a stark snapshot into the egalitarian nature of Australian culture where it is anathema for the individual to be above the team. Some would say that carrying the drinks is not a big deal, and it isn’t, but it does show that Punter is, and despite international opinion, has always been a man where team is paramount. He doesn’t chase milestones or millions, he just gets the job done to the best of his ability. As a captain he fell short at times but you can bet that over the next month he’ll do everything within his considerable cricketing power to give his successor a winning start. It would be even better if he were to go and play some more shield games for Tasmania, so that the next generation of bowlers will come up against someone who they know they’ll have to work really hard to earn his wicket. 24 shield games since he made his first of 156 test appearances 16 years ago doesn’t speak greatly of the Australian system’s ability (at the moment) to provide that competitive, highly skilled, tough competitive edge that took Australia from the mid-80s doldrums to the top of the world a decade later. It’s great that Punter is mucking in and relishing the challenge of test cricket, but I hope the selectors tell him to forget the home ODI series later in the year to go back and play some shield cricket and help the next generation of shield players to test themselves. As he doesn’t iive in Tasmania, I’m pretty sure he’s not keen on playing too much down there. I guess if he thought that his spot was under threat he might go down there to play first class cricket. Good work from Punter re the drinks, but it’s a bit tough on Clarke for him to be handed the towel to throw in already. Ganguly would have never carried the drinks. Great fielding from Punter today, though I can’t say the same for his batting. Difficult pitch, but some of the shots played by both sides were terrible. I’m so used to the Aussies playing stuoid shots that I wasn’t surprised but I thought at home the Lankies might have taken a bit more care. Still, it makes for fascinating viewing. The other good thing is that Punter is never happy. And now Clarke is making him bowl. Ha. Good to see Harris back. There was a lot of under-whelming play from both sides especially with the bat. At least Australia showed some discipline in their bowling and fielding. Difficult pitch. Punter home for the next test. Shaun Marsh will get a gig?